Includes: Private transportation, services of your English-speaking driving guide, taxes, tolls and parking. Departure Points: Assisi, Perugia, Spoleto. Other departure points available. Inquire. This guided day trip features Orvieto, an ancient Umbrian hill town dramatically situated atop volcanic tufa rock. Your private tour of Orvieto, a charming medieval town features a beautiful Gothic cathedral and chapel where pilgrims and art lovers alike come to see Luca Signorelli’s colorful frescoes vividly depicting the Apocalypse. Orvieto is just as interesting below ground as it is above, with Etruscan and medieval caves, and the underground remains of an old olive press, for example. 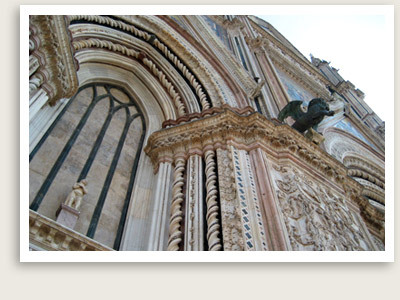 Orvieto is also famous for its museums, ceramics, and wines (most notably the Orvieto Classico). You will also tour the village of Civita di Bagnoregio in Lazio. Founded by the Etruscans over 2,500 years ago, this town has seen its population dwindle to just fifteen residents, earning its unfortunate nickname “the dying town.” You will walk across a 900-foot-long bridge to reach this earthquake-prone village, only accessible by foot.